Soft Gel Corn Wraps are made using cutting edge polymer gel technology offering full wrap-around protection for toes or fingers and relief from corns. 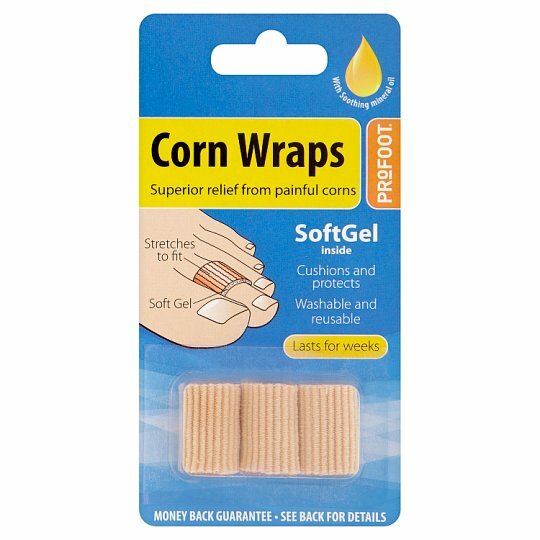 By reducing virtually all pressure and friction to the skin whilst softening the corn and the surrounding areas with mineral oil, Soft Gel Corn Wraps can dramatically aid in the removal of even the toughest corns whilst helping to prevent new ones. Soft Gel Corn Wraps have a slim, low profile to easily fit in any shoe. Works as an overnight finger cuticle softener too! Size: Stretches to fit. For big toes, try Corn Wraps XL. Directions: Slide over toe (or finger). If needed, remove and carefully trim with sharp scissors. To allow skin to breathe, do not wear for more than 18 hours continuously. Care: Carefully wash with water and mild soap. Air dry only. Sprinkle a small amount of talcum powder on the gel after washing to remove stickiness. Replace product when gel has eventually worn thin. Soft Gel Corn Wraps are guaranteed. If you are not satisfied for any reason, return them with your receipt, within 14 days of purchase for a full refund. This guarantee does not affect your statutory rights. WARNING: If you have diabetes or poor circulation, consult a medical professional before using. If pain, numbness, or irritation occurs, discontinue use immediately. Not to be used as a bandage on broken skin. Keep out of reach of children.